Does it look like I shopped at the local doctor’s office? Yep, that is exactly what I did. One of our country doctors passed away suddenly a couple of months ago at a young age. Her daughter is here and having an estate sale. The fabrics I bought will be over on my other blog Quilting On The Cheap. I almost didn’t go to the sale, I had no idea that she was a quilter! I purchased these 3 rolling pieces for a grand total of $14 for all three! 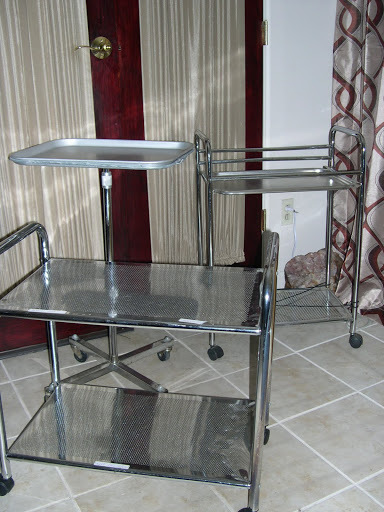 My favorite pieces are the tall table with a removable tray that has adjustable height. The cart in the back holds trays in the top rack. I plan on using the tall piece next to my cutting table so I can roll it either to the machine or design wall with all the little quilt parts on it. The rolling one with the trays I will put embellishments and beads on so I can roll the project to the machine or to my chair to watch TV at night. The cart in the foreground just fits under my sewing station to hold my thread organizers…simply roll it in view when I need different thread. I love finding things like this that look smart and make my life easier. absoleutly wonderful! You're lucky to have scored these. Well, you are just having too much fun on these 'hunts'! I can see whee these tables would come into use.